Like many kids in the Indiana Jones generation, Danny Stockli wanted to be an archaeologist when he grew up. In high school, he volunteered at ancient Roman digs in his native Switzerland. Like most of us though, the dream changed somewhere along the way. His weapon of choice, which for obvious reasons stays back home, is a lab full of mad scientist equipment—desk-sized mass spectrometers and lasers, centrifuges, fume hoods, and plenty of tubes, wires and radiation hazard signs. With it, he reconstructs the thermal history of rocks based on the rate at which different radioactive isotopes decay and their daughter products are incrementally lost due to heating. The tools can reveal when mountains formed, erosion occurred, faults shifted, and petroleum traps formed, among other things. The primary technique he uses, evocatively known as (U-Th)/He, is based on the relative abundance of uranium, thorium and radiogenic helium in certain minerals. Using the technique, he and his doctoral student John Lee showed that part of the Grand Canyon was far older than the 6 million years commonly cited for the entire canyon. He and his colleagues have used the technique to argue for the existence of a controversial type of continental rift in western Tibet. For the oil industry, he’s applied the technique to determine when source rocks were producing hydrocarbons and at what point the overlying seal or trap formed. That information could be worth millions. If, for example, the seal was formed after the hydrocarbons, then they likely migrated away, meaning what looks like a good reservoir based on seismic and other geophysical data might turn out to be a mirage. As an undergraduate at the Swiss Federal Institute of Technology, Stockli took an introductory geology class in which various professors took four week rotations teaching. One was the legendary British structural geologist John Ramsay. Ramsay showed lots of striking slides of deformed rocks and fossils. Tectonic forces that are imperceptible on human scales burst to life. Stockli decided then to become a structural geologist. 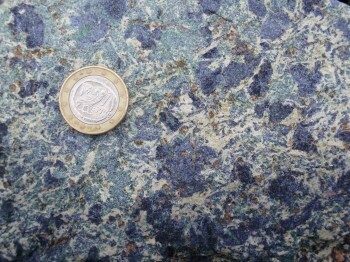 Stockli is now adapting the (U-Th)/He dating technique to new minerals, such as this blueschist from Syros Island in Greece, allowing him to expand into different environments and probe different temperature ranges. Photo: D. Stockli. For his Ph.D., Stockli went to Stanford University and focused on how the enigmatic Basin and Range Province in the Western U.S. was formed. An “army of caterpillars marching toward Mexico” is how one geologist described the rumpled topography of alternating mountain ranges and valleys. Geologists generally agree that extension, or the pulling apart of Earth’s crust by tectonic forces, gave rise to the unusual formation, but they continue to argue over the details. Conventional wisdom held that the province went through several periods of extension. Stockli used the tools of thermochronology to estimate the location, timing and magnitude of each period. And that’s where the big surprise came. He found that much of the extension occurred simultaneously across the entire province in a very short time (geologically speaking). One tool that was critical to his work—you guessed it, (U-Th)/He—was just being developed by Kenneth Farley at the California Institute of Technology. Stockli brought his samples to Farley’s lab to do that part of the analysis and he started to see ways the tool could be applied to all sorts of other problems in earth science. After graduating, he joined Farley’s lab as a post doc. Like his happy encounter with John Ramsay a decade earlier, his interactions with Farley changed the trajectory of his career. He became so fascinated with the tools of thermochronology that he began to transition from a pure structural geologist to a geochemist. As an assistant professor and then associate professor at the University of Kansas, he set up his own (U-Th)/He lab. It became one of only three major, dedicated labs for the technique in the world. Why so few? The equipment is expensive and it doesn’t come pre-packaged—you have to have some mechanical and electrical know-how. And the technique itself is still relatively new, so the pool of people who know how is limited. Although he didn’t invent the technique, Stockli has worked to push it far beyond its original capabilities. In the early days, it was limited to apatites and zircons, minerals found in granites and sandstones. He’s now developing the technique for other minerals such as magnetite, monazite, serpentinite and blueschists, allowing him to expand into different environments and probe different temperature ranges. This past summer, Stockli moved his entire (U-Th)/He lab to the Jackson School, where he is now a professor. The University of Kansas graciously allowed him to take the unique facility, which he constructed with KU start-up funds, with him. With the addition of Stockli and his lab, the Jackson School is emerging as a leading center for geo- and thermochronology. The U-Th/He technique is often used in conjunction with a technique known as apatite fission-track that Rich Ketcham, professor in the school, specializes in. Together, a more complete picture of a rock’s thermal history can be deduced. 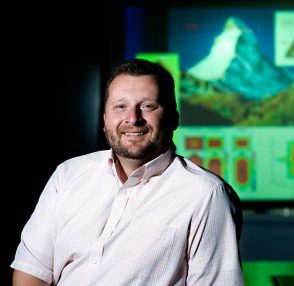 Stockli uses geochronology techniques to study tectonic processes such as the rifting of continents. 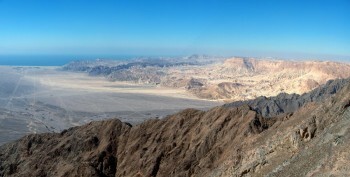 The rift flank of the central Gulf of Suez rift can be seen in this photo from Gebel Samra, Sinai Egypt. Photo: D. Stockli. Stockli also plans to collaborate with other scientists working in related areas, including Mark Cloos, Brian Horton, Luc Lavier, Terry Quinn, Tim Shanahan, Liz Catlos and Jaime Barnes. Stockli is bringing to UT the remainder of a $2.4 million stimulus grant from the Department of Energy (plus cost sharing from partners University of Oklahoma and Sierra Geothermal Power Corp.) for geothermal research. One of the big obstacles to exploiting geothermal energy around the country is the high cost of exploration. Some geothermal hotspots give themselves away by releasing steam at the surface, such as in Yellowstone and The Geysers in northern California. Most of the resources, however, are hidden. Some experts say the field of geothermal exploration is about where petroleum exploration was in the early 20th century. Stockli and colleagues have used the thermal history of rocks in Nevada’s Clayton Valley, about 150 southeast of Reno, as well as geophysical data, to predict the locations of long lived thermal anomalies. Next year, the team will drill rock cores to confirm the locations and conduct flow testing. Ultimately, the goal is to show investors that the exploration tools Stockli and others have developed do a good job of predicting the performance of geothermal resources. Many of his other research projects focus on extensional tectonics and rifting processes in the Middle East and the western U.S. In a new research direction that takes him closer to his early interests, Stockli plans to wade into an archaeological controversy that has been brewing for more than three decades. At some point in the ancient past, the island of Santorini (a.k.a. Thera) was rocked by one of the largest volcanic eruptions in recorded history. It destroyed Minoan settlements and deposited a layer of ash on much of the eastern Mediterranean region. Historians have suggested it was the inspiration for the legend of Atlantis. Based on pottery and other artifacts, archaeologists have dated that event to about 1500 BCE. It’s become a key date in the chronologies of several Mediterranean civilizations, including the Greeks, Egyptians and Minoans. Then in the 1970s, scientists measured radiocarbon dates for the ash layer that placed the eruption more than a century earlier. If correct, it would be a major headache for historians. Until recently, the (U-Th)/He technique wasn’t able to accurately measure such young ages. But Stockli’s new lab will include a higher sensitivity mass spectrometer, which will allow him to measure volcanic samples with much less helium and should finally allow him to weigh in on the controversy.